Paleontologists have learned many things about dinosaurs by studying the fossilized remains of their bones and teeth. By studying the teeth of dinosaurs, scientists can find important clues about what the different types of dinosaurs ate and how they got their food. Dinosaurs that ate meat needed teeth that were as sharp as knives. Dinosaurs that ate plants needed special teeth that would pull the leaves off of branches and grind them up. Some dinosaurs had overbites, much like human overbites. Each dinosaur tooth served a special purpose to help a dinosaur eat. Dinosaurs were alive during the Mesozoic Era, which began around 230 million years ago. The Mesozoic Era has three different periods in it, which are the Triassic Period, the Jurassic Period, and the Cretaceous Period. Dinosaurs were all different sizes, with some as small as a chicken and others that weighed almost 90 tons. Some dinosaurs were carnivores, which are animals that eat meat, while others were herbivores, which are animals that eat plants. A few dinosaurs were omnivores, which means that they ate both plants and meat. "Dinosaur" is a Greek word that means "terrible lizard." Dinosaurs were reptiles that walked with their legs right under their hips, which is different from how modern reptiles like crocodiles walk. 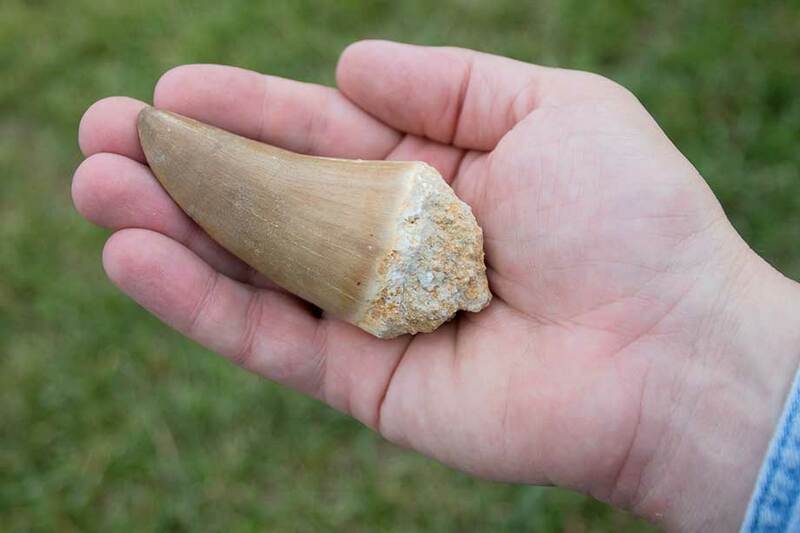 To learn about dinosaurs teeth, paleontologists look for and study fossils. Fossils are hardened minerals that take on the shape of bones that once existed. Over a very long period of time, the bones are buried and then dissolve, leaving behind empty spaces that are filled by minerals. Fossils are found buried in the ground, and they can hide virtually anywhere. Paleontologists often dig in stone quarries, in mountain areas, and in creek beds because it's common to find fossils in these areas. While digging, they take away small amounts of dirt at a time so they don't overlook or damage any fossils that could be hiding there. Limestone rocks often have plant fossils in them, so scientists often search for limestone, too. A fossil has to be at least 10,000 years old to be considered a true fossil. Paleontologists have found fossils that are 3.5 billion or more years old! Body fossils are fossils of the remains of animals, such as bones, teeth, and shells. Trace fossils are fossils, but they aren't the remains of animals. Trace fossils might come from plants, or they could be footprints left in the soil. When something leaves a footprint, that space often fills with other material. When this happens, a cast fossil forms. Scientists have discovered that dinosaurs could grow new teeth when their old ones became too worn down. The hadrosaurus was the dinosaur with the most teeth. This dinosaur had almost 1,000 teeth! Fossilized teeth give scientists clues about how dinosaurs ate. Some front teeth are designed to bite and tear off meat. These teeth are called incisors, and they have sharp points. Other teeth in the back are used to grind food before swallowing. These teeth are called molars. When scientists find flat front teeth in a dinosaur skull fossil, they guess that the dinosaur ate plants. Scientists also get clues about dinosaurs from the other fossilized bones they find. For example, the number of legs a dinosaur had often tells us about how it lived. Dinosaurs with four legs and long necks probably ate plants, and they may have been able to reach the tops of trees to eat from high branches. Dinosaurs with four legs and short necks probably ate plants that were close to the ground. Dinosaurs with two legs may have been able to run fast. That suggests that these dinosaurs may have been meat-eaters, since meat-eating dinosaurs had to chase other dinosaurs for food. 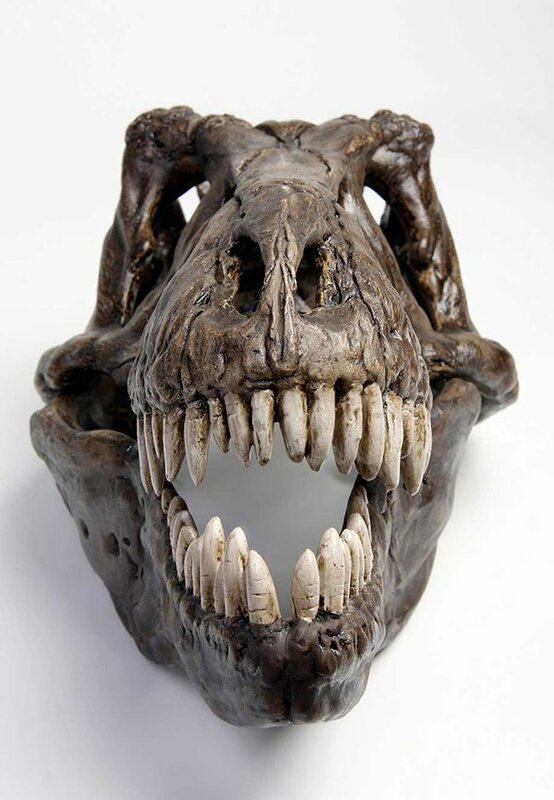 Some plant-eating dinosaurs did not use their teeth for chewing. Instead, they used their teeth to strip leaves from branches. Some dinosaurs had no teeth at all. These dinosaurs used their gums to grind their food. The dinosaur with the biggest brain was the troodon. Scientists guess that this dinosaur may have been the smartest. The dinosaur with the smallest brain was the stegosaurus. This dinosaur's brain was about as big as a walnut.